With evidence that the slowing economy is prompting employers to put the brakes on hiring, the summer internship assumes a new level of importance as the most effective road to post-collegiate employment. Even if the current downturn is brief, it could take several months, if not a couple of years, for the job market to fully recover. At the moment, the job market for college graduates appears relatively healthy, but it can take several months for economic conditions to impact lower-paid entry-level job seekers. College seniors without a job lined up prior to graduation could find employers less welcoming than a year ago. And, next year’s graduates may have a more difficult time breaking into the job market. The latest figures from the Bureau of Labor Statistics indicate that the economy is losing more jobs than it is creating. Non-farm payrolls have declined by 260,000 jobs since the beginning of the year. Right now, the current economic difficulties do not seem to be impacting the hiring of recent college grads. In fact, 68 percent of companies expect to hire either more or the same amount of college graduates than last year, according to a Challenger survey of 100 human resource executives. How many 2008 college graduates will be hired? A February survey by the National Association of Colleges and Employers (NACE), which found that employers expect to hire 8.0 percent more new college graduates from the class of 2008 than they hired from the class of 2007. However, there are some signs that the market for graduates may be cooling. The 8.0 percent increase in hiring represents a drop from the same survey last fall, when employers said hiring would increase 16 percent. Next year’s graduates may suffer the most from this slowdown, which makes this summer’s internships among college juniors particularly important. The slowing economy probably will have little impact on internships, since it is a short-term commitment and many companies pay their interns little or nothing. This may present a financial struggle, especially for new graduates who have to begin repaying school loans, but it may be the best way to secure a full-time paying position at the end of the day. While internships are vital to establishing contacts and integrating classroom knowledge into work world experience, often the best perk of an internship is the chance to earn a full-time job. A separate NACE survey found that 69.6 percent of 2008 interns received full-time job offers with nearly 73 percent accepting. Employers view internships as a valuable hiring tool. It gives employers the chance to evaluate a potential employee’s performance for an extended period of time in real-world conditions. It also lets an employer gauge how the intern fits into the company culture, which is nearly as important as skills and experience. As an intern, it is critical to treat each day like a job interview. You want to set yourself apart from your fellow interns. As the slowing economy potentially leads to fewer full-time positions, it is critical that interns exceed expectations. Those who merely meet expectations probably will not get the full-time job offer. Meeting the right people during your internship is also critical. It is likely that the person supervising the interns is relatively low on the corporate totem pole. In fact, he or she may be only a year or two out of college. The intern with full-time job aspirations should make a daily effort to meet the managers and executives who make the hiring decisions. The higher up the executive you impress, the greater the odds that a permanent position will be found for you. Students who do not receive an offer from the company where they interned can still benefit from the experience. Managers and executives in the company represent the beginning of your job-search network. Even if they cannot find a spot for you in their company, they may know executives in another company that may have openings. Treat your internship as a real job. The best way to prove you are qualified for a permanent position is through action. 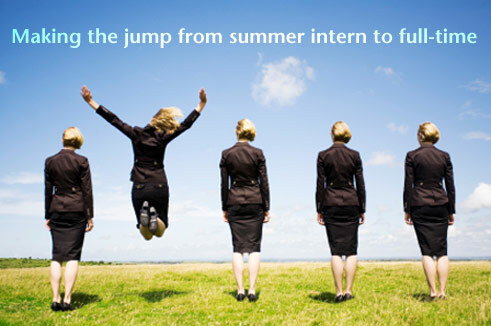 Think of your internship as a trial period or extended interview for obtaining the position you desire. Always be on time and meet deadlines. Maintain a positive attitude and show that you are eager to learn and succeed by seeking out feedback to improve your performance and develop new skills. Take initiative and exceed expectations. By taking initiative you can show management what you are capable of. Do not be afraid to voice your own ideas, offer solutions, and ask questions. Show interest in attending meetings and seek out extra work and new projects. When you go above and beyond the minimum, you demonstrate your commitment level and gain the attention of management. Dress according to company dress codes. While you want to stand out from the pack, you don’t want to draw attention to yourself for the wrong reasons. By dressing professionally you reinforce the impression that you can adapt to and fit in with the company’s culture. Keep track of your contributions and accomplishments. Keep track of the projects you worked on, your individual contributions, and the results achieved. Having a tangible record of your achievements with the company is a helpful tool in convincing a manager why you should be hired full time. Developing contacts inside and outside of your department is extremely important. Schedule lunches or meetings with company managers and executives to give them a better understanding of what you’re about and what you plan on accomplishing. Find a mentor to teach you the ropes of the organization and offer advice on company politics. The contacts you make through your internship could prove invaluable throughout your time at the organization and throughout your career. Ask about available entry-level positions. Let your employer know that you would like a job with that particular organization. Ask about what positions are available and express your interest in them. An employer will be more likely to consider you for a position if they know you are interested in it. If you don’t get hired for a position immediately after your internship ends, stay in touch. Check-in with your contacts and provide updates on your progress. This will help to keep you in the forefront for the employer’s mind when a position opens.